As I mentioned in my profile, I have been making my own soap for more than 10 years. Jim and I have not bought a bar of soap in all that time. We were down to our last bar, so last week I made two batches. I use palm kernel oil, almond oil, grapeseed oil, castor oil, and olive oil in my soap. In one batch I used peppermint and lavender essential oils for the scent. In the other batch, I used rosemary, peppermint, and eucalyptus essential oils. The Rosemary blend one is Jim’s favorite, so I make it every time I make a batch of soap. 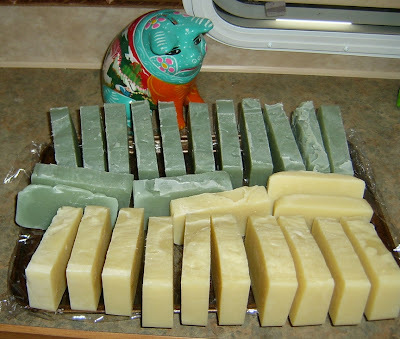 In the picture above, the greenish soap is the lavender mint; the other one is the rosemary-mint-eucalyptus. My sad piggy bank from Mexico is watching over the bars. I have some pretty molds that I use sometimes, but this time I was in a hurry, so I just used the loaf mold that one of my friends made for me. I gave him a bath size bar of Ivory soap and told him to make me a loaf mold that would make the finished soap that size. It is made out of pine wood, and has a divider in it so that I can make two different scents at the same time if I want to. I line it with a plastic trash bag so I can lift the loaf out when it is ready to cut. The picture below is my of my wooden loaf mold. I love soapmaking but I am chicken of lye so I use the melt and pour. It is fun and you know what is in your soap. Thanks for sharing your soapmaking with us and you have a very nice blog.